I recently asked my friends over on Instagram what they'd like to see here on the blog in the near future, and I got a couple of requests for Paleo-friendly holiday treats that could be packaged up for loved ones. 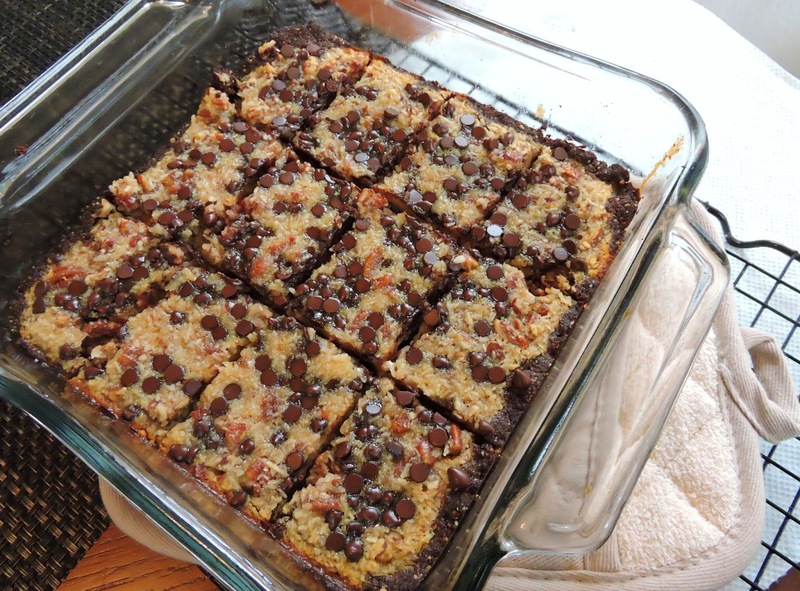 Since anything "German chocolate" is a favorite around here, I decided to come up with a bar version that could easily be sliced, plated, and given away. 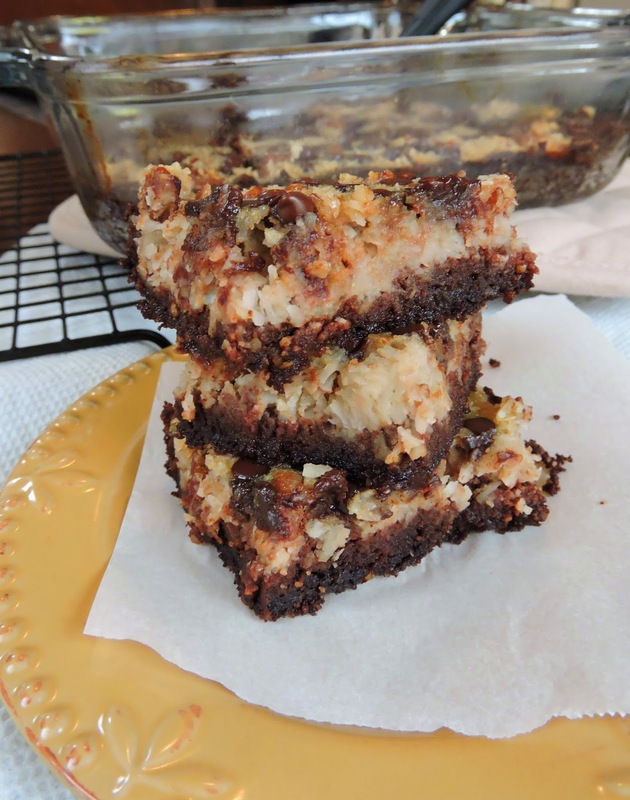 These indulgent bars taste much like a traditional "7-layer bar" or something along those lines... chocolatey, coconutty, moist, and chewy; with all sorts of sweet & decadent flavors mixed in. The best part, though, is that the work required to make them has got to be less than half! P.S.~ This recipe was very loosely based on one I found online from Paula Deen that is not at all Paleo... Link here if you're interested! Grease a 8 x 8" glass baking dish with coconut oil or coconut oil spray. Bake for 6 minutes, then remove from the oven. While the crust is baking, combine the ingredients (minus the chocolate chips) for the filling in a large bowl. Add the filling over your semi-baked crust, sprinkle with chocolate chips, and pop it back in the oven. Bake for 25-30 minutes, or until the top is lightly golden brown & the filling is set. Allow to cool completely (I even transferred mine to the fridge for awhile) before slicing into squares. *Makes 12-16 bars..... Double the recipe & bake in a 13 x 9" pan for a large batch! Tried these bars out with some friends and it was a huge hit. This recipe is just genius! :) Thanks! Can u leave out or are they best refrigerated? I would keep them refrigerated. Then warm in the microwave before you serve if you like! I just made a double batch, the house smells incredibly chocolate-y and I can't wait to dive in! I added a scoop of unflavored protein powder to the filling to up the protein level. Thanks for sharing this awesome and easy recipe. OMG!!! These are to die for. Took some up to friends house last night for coffee snacks and the hubby friend took a bite and said "OH MY"! He usually scoffs at my paleo diet. A million thanks for this incredible recipe Jessie! Thank you for the great feedback, Pamela!! Always makes me happy when non-Paleo eaters approve a recipe! Thanks again & glad you enjoyed! I'm trying to incorporate some paleo recipes into my life.. I tried this. I haven't sliced it or ate any yet. I will when it cools. A couple things about the recipe... shredded coconut, do you use sweetened or unsweetened. I opted for unsweetened... the coco... was it baking cocoa or sweetened cocoa? I pinched a piece of crust off.. I use good dutch cocoa... it seemed really bitter. I'm considering using half raw sugar next time. I'll wait and decide after I actually taste one. Was gonna take them to a bbq, but waiting till I taste. I may be running out to the bakery tomorrow..
Ok.. I left them in the fridge overnight.. My husband liked them.. crust is a bit crumbly. Maybe cut the time back. I did make a double batch but there were no instructions on any changes for that. Not as rich as I'm used to, but I could get used to this. I think my daughters are gonna love it! Hi Mary, You were correct to use unsweetened coconut. It's sweet enough in it's natural state. Unsweetened on the cocoa too. If you wanted it to be truly paleo use unsweetened cacao, very different from cocoa and is naturally sweet. Did you add the required amount of coconut sugar to the crust. Mine was just the right amount of sweetness with the amount stated in the recipe. Your crust was probably fine as mine was a bit crumbly too. We ate ours on a plate and not hand held because of that :-) Doubling the recipe is literally that, just double all the ingredients. It's seriously one of the best things my mouth has tasted! Well, I must say I made this late in the evening, and was tired. I can swear I used the right amount of suger. On another note, to me, after sitting in the fridge till the next early evening, I took them to the bbq. I brought home less than a quarter of the 13 x 9 pan. The few that I told they were paleo loved them! I thought they were delicious! The best was for my daughter, the baker to tell me there were awesome, and the host and her kids loved them! In fact, when we were leaving she had tried it then as she hadn't yet, and when she did, she got a plate to keep a few for herself! She's a great cook and cooked and managed a kitchen. I also cooked for a caterer for 15 years. I can't wait for my gluten free daughter to try them! I wish you were on facebook. Would love to follow more of your recipes. I just may have to keep checking your site for more delicious recipes! Thank you for being patient with my comments! :) My thought, could adding a little agave to the crust mix help it to hold better? Your thoughts? This looks amazing. I am going to try it out in the next couple of days. Thank you for giving us something to drool over. Do you happen to know the carb count on these? Can I use almond milk rather than coconut milk? Hi there...I made these tonight and they were very good. I'd like to make them for a friend but she has asked, "Would you recommend using a sugar substitute for the coconut sugar?" Thanks! Hi Jessie... What can I replace egss with? Thanks! Anonymous~ I'm so glad you enjoyed them! I've only made these with coconut sugar, but brown sugar or honey might do the trick. Gunjan~ I can't personally recommend any egg replacement, as I've never tried it. I've heard there are some formulas out there using ground flax seed to replace egg~ might be worth a Google search! champ-clé~ Did your mixture fill up the baking dish? I don't know how you would have only gotten two bars, as the mixtures would fill an entire dish, but I'm sorry that happened. I live in the US & only use our standard measurements. You could try using an online measurement converter tool. One standard-sized can here is about 13-14 oz. I will include that in the recipe. Thanks for sharing your experience-- I hope work better for you next time! @Mo Haha, thank you so much for your kind words! I'm glad you found me :) If you're in the market for a new breakfast casserole recipe I would highly recommend the "Sweet Potato Crusted Egg & Chorizo" one that I recently posted! It's been a new staple around here. :) Take care!! Or, I've read that flaxseed meal can make a good alternative as well! Jess, OMG I couldn't wait for these to completely chill!!! I love it I love it Thank you sooo much for this recipe!! 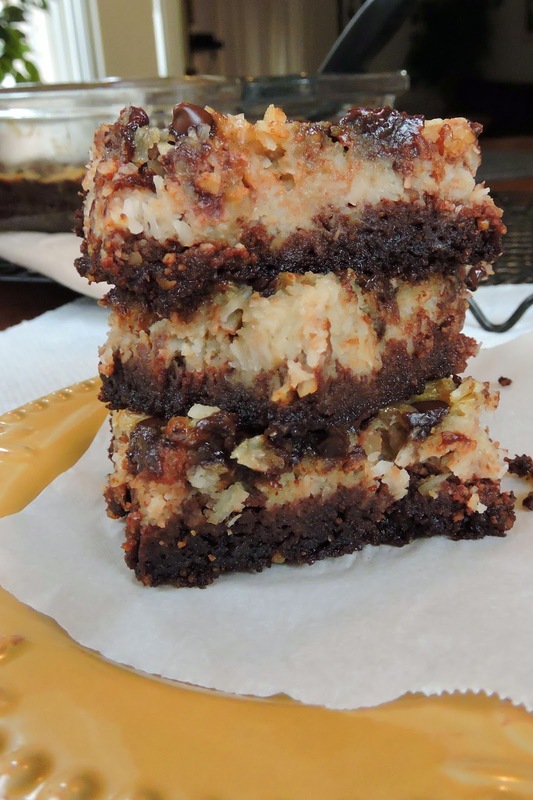 It is like the 7 layer bar take off with an oreo cookie bottom crunch!! I cut into 9 squares and doing my best to stay out of the kitchen!!! I love your website. Keep them coming sweetheart, you are doing an awesome job!! @Molly, This is the best comment ever; you made my day! & I love the Oreo cookie comparison for the crust... I totally agree! So glad you enjoyed the recipe, and thank you so much for coming back to leave some kind words. It means more than you know! How long would you let these cool for at room temperature? I was thinking 2 hours. Thanks. Amazing cake! Made it for my birthday and everyone ("normal" eaters) loved it. I have a question concerning the crust: Do I have to whipp the egg white stiff and fold it together with the rest? Or should I simpley stirr it together with the other crust ingredients? I also let out the pecans and I do not know if that made the filling cheesy/fromage-likely, but I loved it! But I had to bake it over an hour. I doubled it and it did not turn out at all. It never firmed up. Baked for an hour .